Despite USAA’s other merits (like affordable car and homeowners insurance), competitive interest rates aren’t anything to boast about at this bank. While the military-focused bank has a plethora of financial products, the checking accounts, savings accounts and certificates of deposit (CDs) have low interest rates. That means if you’re looking to earn the most with your money, you may have to look elsewhere. Keep in mind you have to meet eligibility criteria to even become a member of this mostly online financial institution. With just four physical locations, it’s likely that you’d do all your banking remotely if you become a member. Started as a car insurance company in 1922 by a group of Army officers, United Services Automobile Association (USAA) has grown to more than 11 million members and offers a full suite of banking options. Eligible members can choose from checking, savings and CD accounts, credit cards, mortgages, auto loans, retirement and, of course, insurance. In addition to car insurance, USAA offers personal property, health, homeowners, flood and small business insurance as well as annuities. Almost all of USAA’s products are mobile-friendly. This is because the company was at the forefront of direct marketing via phone and were early adopters of the internet. That means the USAA mobile app and online experience is robust. One of the most popular checking account features is that you don’t have to worry about monthly fees and ATM fees are reimbursed due to the limited number of physical branches. That said, USAA does not have checking or savings account interest rates that are competitive with some online banking options. What the company lacks in competitive interest, however, it makes up with having a huge array of insurance, retirement and loan options. Access to Your Savings Account Online, mobile and physical branches. A savings account is a smart place to park extra cash for emergencies, large purchases, vacations and more. At USAA, the basic savings account has no minimum daily balance, no monthly fees and features fraud protection and mobile check deposit. You need $25 to open the account, but after that, you’re not required to keep a certain amount of money in the account to keep it open. You’ll only earn a fraction of a percentage of interest on the account, so don’t expect large returns with this account. Even if you keep $10,000 in the account, the interest rate goes up to just 0.15%. While you can request a free ATM card for cash withdrawals, you can’t use the card for purchases. As with all savings accounts, the government limits how many withdrawals or outgoing transfers you can make each statement cycle to six. Deposits are unlimited, but if you go over the outgoing transaction limit you can face penalties and account closure or conversion to a checking account. When you’re saving a large amount of money, say, for a down payment on a home, you want to earn some interest while your money sits in a bank. USAA’s Performance First Savings Account offers higher interest rates than its regular savings account, but you’ll need at least $10,000 to open one. While you aren’t required to keep $10,000 in the account, you won’t earn more than 0.05% interest without having a balance over $10,000. The maximum amount of interest you can make is 0.30%. Just like the regular savings account, you’ll have the option to get an ATM card for cash withdrawals. Most interest-bearing checking accounts have high minimum balance requirements, but at USAA you won’t have to worry about that with any of the checking accounts offered. You need $25 to open an account, but there is no minimum daily balance requirement. New military recruits have no opening deposit requirement. That said, you won’t earn much interest at all with Classic Checking or Youth Spending, the two accounts that earn interest. Rates are low, at only 0.01%. That means you won’t exactly be earning much money with your checking account balance. All three checking accounts have no monthly service fees, no minimum balance requirements, free debit cards, overdraft protection and free ATM withdrawals (within the monthly limit). Classic Checking is just what it sounds like: a traditional checking account. You’ll receive a debit card and you can make unlimited withdrawals and deposits each billing cycle. Interest is just 0.01%. USAA offers 10 free ATM withdrawals and up to $15 in ATM usage fees per cycle. Cashback Rewards Checking offers $0.10 per each debit card purchase over $1. However, that’s a debit card purchase of any size, so the reward doesn’t seem as appealing as a cash back credit card that rewards each dollar spent, rather than number of transactions. The Youth Spending account is way for teens, 13 to 17, to learn how to use a checking account while under parental oversight. You can set ATM and debit limits, sign up for text alerts such as an alert if your child exceeds the spending limit and allow the child limited access to usaa.com. Youth Spending includes zero liability for unauthorized charges. That’s the same kind of protection offered by credit card companies and is usually not a feature of debit card accounts. Access to Your CD Online, mobile and physical branches. Fees No account maintenance fees. Penalties for early closure/withdrawal. A certificate of deposit (CD) is a type of savings vehicle that generally earns more interest than a savings account because your money is set aside for a certain length of time. During this time period, you generally can’t withdraw funds from the CD without facing a penalty. You also won’t earn the interest you sign up for if you withdraw funds early. USAA has three types of CDs: variable, adjustable and fixed rate. The variable rate option operates similar to a money market account rather than a classic CD. With this account, you can make additional deposits, which is normally not a CD feature. USAA requires a minimum deposit of $250. You can add more money when you wish, but you can’t withdraw until the maturity date. The rate is higher than the Performance First Savings Account (that has a $10,000 minimum deposit), so it may be a good option for USAA members who don’t need to withdraw from the account for at least six months and want to benefit from decent interest rate while saving. The adjustable-rate CD has three different term lengths and offers you the option to request a one-time rate adjustment (up to 2%) if interest rates increase. With this CD, you can’t add more money after the initial deposit. The third option is a fixed-rate CD, which is one of the most common types of CDs available. You have terms starting as short as 31 days (for deposits of $95,000 or more) and as long as seven years. The rates increase the longer the term and the higher the deposit. With this CD, your interest rate and your term is fixed, and you can’t add additional funds to the deposit. Access to Your Account Online, mobile and physical branches. One of your options for saving for your children’s college education is through a 529 College Savings Plan. This type of college savings plan is tax-advantaged and allows contributions up to $70,000 a year without incurring gift tax. This type of plan has the highest contribution limits, you’re allowed to deposit up to $370,000 in the account. You can contribute up to the limit and the money can grow through investment returns without penalty. The account owner can withdraw money for any qualified educational expenses, tax-free. If money is withdrawn for other uses, income tax and a 10% penalty is generally levied due to the tax-advantaged nature of the account. USAA’s 529 plan is administered through the state of Nevada. While you don’t have to be a resident of the state to open an account, it might be best to see what your state offers before committing to USAA’s option. The first $1,050 of investment income is tax free. The second $1,050 of investment income is taxed at the child's rate. More than $2,100 of investment income is taxed at the parents' marginal tax rate. These two types of accounts, Uniform Transfers to Minors Accounts (UTMA)/Uniform Gifts to Minors Act (UGMA) are savings vehicles for minors. This type of account is generally not tax-deductible or tax-deferred. However, the first $1,050 of investment income is tax free, the second $1,050 of investment income is taxed at the child's rate and more than $2,100 of investment income is taxed at the parents' marginal tax rate. Contributions of more than $15,000 will incur a federal gift tax ($30,000 for married taxpayers), but there are no actual contribution limits to this type of account. Once you contribute money to the account, you can’t withdraw it; only the beneficiary can. Once the child reaches 18 (or 21, depending on the state), he or she has legal control of the account. You’ll want to keep in mind that this type of account can reduce college financial aid eligibility for your child. USAA offers Traditional IRAs, Roth IRAs and rollovers and transfers. At USAA, unlike many big banks, you’re not limited to investing in CDs for your IRA. You can choose from stocks, bonds, ETFs, mutual funds and CDs. It’s up to you on how to construct your IRA portfolio. The company also offers target funds that are based on when you expect to retire. If you have plenty of years until retirement, the fund will have more aggressive investments. And if you’re close to retirement, it’ll consist of more conservative investments. Contribution limits are generally limited to $5,500 a year. Where Can I Find USAA Bank? This bank is headquartered in San Antonio, Texas and has just four physical locations: Colorado Springs, Colorado; Annapolis, Maryland; Highland Falls, New York and San Antonio, Texas. USAA has always been on the forefront of digital banking and has not operated a significant number of physical branches throughout its entire history. What Can You Do Online With USAA Bank? You can do just about everything online with this bank. Deposit checks, transfer funds, pay bills, trade stocks, apply for loans or insurance, open new accounts - you name the function, and the website or mobile app will likely allow you to do it. You can customize your online dashboard to show your savings goals and rename accounts to whatever you choose (such as travel fund or bill paying account, etc). There is a USAA blog/financial advice center and a question and answer forum that looks similar to Quora. The bank was one of the first adopters of internet banking and the first to create mobile deposit technology, developing the technology in 2005 and launching to customers in 2006, according to American Banker. 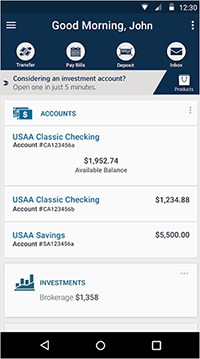 USAA has mobile banking apps for iPhone and Android users, with the former garnering an average of four stars out of more than 3,000 reviews on iTunes and the latter a 4.6 after almost 10,000 reviews. Most customers access money online through their account dashboard or with the mobile app. You can send money with an electronic transfer and pay bills this way. To deposit a check, you can use Deposit@Mobile® on a tablet or smartphone. If you don’t have access to the internet or to a mobile device, you can deposit a check by mail (assuming you’re not located near a retail branch). To withdraw cash, you can use any ATM and receive up to $15 back (with certain checking accounts) or 10 in-network ATM free withdrawals (a network of 60,000 preferred ATMs) a month with your debit card. You also can get cash back at locations that offer the service. Of course, if you’re if you’re in the vicinity of one of USAA’s four locations, you have the option to withdraw funds in person at a physical location. Finally, to deposit cash there are a limited number of cash-deposit-accepting ATMs in areas of high member concentration. These locations tend to be near U.S. Army installations. For those trying to deposit cash outside the area, options are limited and the best solution is to deposit at a local bank and transfer to USAA. How Can I Save More Money With a USAA Account? You won’t save much with the savings products USAA offers, unfortunately. Compared with the banks we’ve already reviewed, its rates just aren’t close to the top tier. In fact, they’re pretty close to bottom of the bunch. Even the cash back debit account isn’t that lucrative. You earn just 10 cents per debit card transaction. Let’s say you use your debit card 60 times in a month, you’d earn $6. You’d be much better off using a rewards credit card to earn cash back. The interest-bearing checking account nets you just 0.01% and that’s with at least $1,000 daily balance or more. You could stand to earn much more with a Bank of the Internet or EverBank high-yield checking account. Same goes for CD rates. Barclays and Capital One offer much better interest rates than USAA. All said, you save the most with USAA insurance rates. The company’s origins are in car insurance and that’s one of the top products for members. Homeowners insurance and life insurance are also contenders. USAA may not have the best savings and checking account rates, but free or reimbursable ATMs, well-designed mobile apps and a large variety of banking options are reasons why people choose this bank. What’s the Process for Opening an Account With USAA Bank? First, you’ll have to verify that you’re eligible to become a member of the bank. USAA states that active military, former military with an honorable discharge, cadets and midshipmen and family are eligible for membership. Not all family members can join, however. Spouses and dependents of veterans or active duty service members and children of USAA members can join, but not siblings or parents of service members. This is a change from the rules that were in place from 2009 to 2013 that allowed civilians access to select USAA products such as bank deposit account and life insurance. The most common way to open an account is online through USAA’s website. Those who live near one of the four bank locations can visit a branch and apply for an account in person. Otherwise, you can follow the steps listed on the website to open an account. Alternatively, you can call and speak to a representative. You’ll need your date of birth, contact information, including address and Social Security number. To fund the account, you’ll also need an initial deposit that varies in size depending on what type of account you’re opening. For example, to open a USAA Cashback Rewards Checking Account, you’ll need at least $25 as your initial deposit. You can deposit those funds via an online bank transfer from a current bank to your new account, with cash at one of the four retail locations or with a wire transfer (generally incurs a fee) from an outside account. After you fund your account, you’ll start earning interest (if it’s an interest-earning account). You can track your account balance and interest earnings online, through the mobile app or by calling the company and speaking to a representative. The most obvious catch is whether you’re eligible for membership. You have to be a veteran or have an eligible connection to one, there’s really no way around it. But if you are eligible, there are still a few other downsides. One is that you won’t find impressive savings account interest rates, or checking account rates for that matter either. USAA just isn’t competitive with the interest offered at institutions such as Ally Bank or Marcus by Goldman Sachs. That’s why most members of USAA use the company’s flagship product: auto insurance. That’s where the real savings are, not in its savings accounts. To be fair, the rates offered here are quite similar to banks like Wells Fargo, Chase and Bank of America. It makes sense, USAA is one of the top 25 banks in the U.S., and most of the larger banks that offer a wide range of retail banking products tend to have lower interest rates. The other potential drawback is no money market account offerings. While the bank has college savings plans, CDs, savings accounts and more, you won’t find a money market account, just the variable rate CD as a close alternative. If you want to open a money market account (that doesn’t have the maturity date restrictions the CD has), you’ll have to turn to an alternative such as EverBank or Capital One. USAA Bank can provide a one-stop shop for your banking, retirement, loan, insurance and other financial needs. The trick is whether you’re qualified to join or not and whether you care about getting the highest interest rates. If you don’t mind having accounts at several different banks, you could always open a high-interest savings account with Marcus by Goldman Sachs or Ally Bank and let USAA take care of your other needs. But if you’d rather have all your money in one place while still earning high interest, your needs might be met best elsewhere.